This one-hour DVD provides a 75-slide PowerPoint presentation by Dr. Teitelbaum in which he discusses chronic fatigue syndrome and fibromyalgia. Dr. T explains what causes these illnesses, and how to make them go away! He also reviews common causes of pain (e.g., migraines, arthritis, carpal tunnel syndrome and nerve pain) and offers powerful, effective natural options to treat these as well. 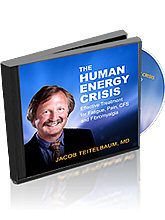 CFS and fibromyalgia represent an energy crisis, causing people to "blow a fuse" (called the hypothalamus). This causes body-wide problems. The DVD presents a detailed explanation of his proven S.H.I.N.E. treatment protocol (Sleep, Hormones, Infections, Nutrition, and Exercise as able) — which in a published placebo-controlled study resulted in 91% of people with CFS/FMS improving, with a 90% average increase in quality of life! By the end of the DVD you will know what you need to do to get your life back!